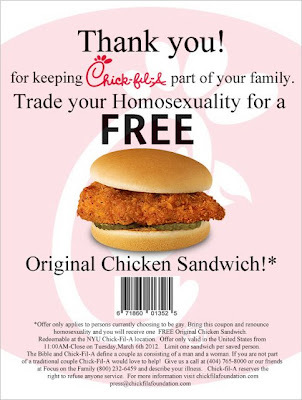 Remember a while ago when the CEO of Chick-fil-A stated he was against equal marriage? Well check out this parody created by the founders of the satirical Chick-fil-A foundation. They manage to get a free chicken sandwich after presenting this fake "trade your homosexuality for a free chicken sandwich" coupon.